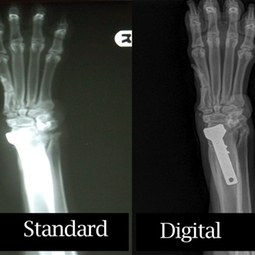 Greener Pastures Veterinary Service also has Digital Radiology, a valuable diagnostic tool. Digital Radiology is essentially the "HD TV" of radiology. The image is projected to a computer which allows the veterinarians to manipulate the image to enhance diagnostic ability. If a second opinion is needed, the image can be sent wirelessly to a Board Certified Veterinary Radiologist to be read. This referral used to take days but now the radiologist report will just take a matter of hours. Another attribute is that those clients that would like a copy of their pet's radiographs can receive them on a CD or via email. All of these functions allow us to provide better care for our patients. Click Here to see our Digital X-Ray in action. We also have a portable x-ray machine that can take digital x-rays of our bovine and equine patients.